I’ve spent the last week in England, staying a few days with my parents and also learning how to shear sheep. I helped my mum and dad clear out their garage: a three-day-long task of dust, mouse droppings, nostalgia, surprises … and quite a lot of old toot. Thanks to the Northampton branch of the UK based charity Tools for Self Reliance we’ve turned one man’s (Dad’s) “rubbish” into another man’s (an artisan in some rural African community) treasure. 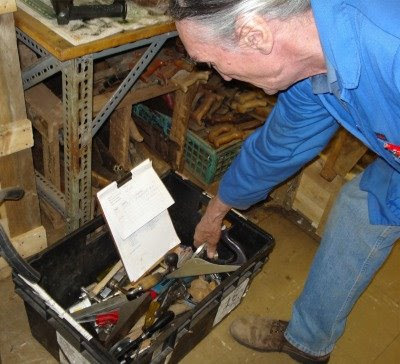 With a small number of paid staff assisted by an army of volunteers, old tools are polished, sharpened and refurbished until they’re good enough to be boxed up according to particular orders and shipped to partner organisations in Africa. 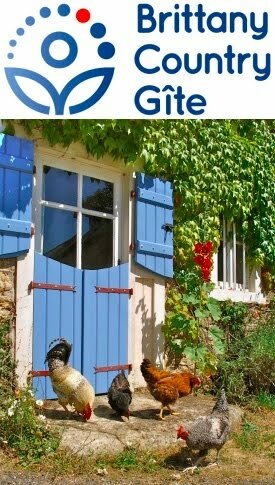 Have a look at their excellent website to learn how you can help, where your nearest branch is and what tools they do and don’t need. Owing to a pair of bright yellow lines painted on the road outside, mine was a fleeting visit and I didn’t manage to get anyone’s name. In the photo above, a member of staff shows one of the boxes of refurbished tools, along with a packing list, ready for despatch to Africa. Having read their website, I see that they don’t have a need for certain tools (e.g., typewriters, computers, books, lawnmowers, cooking pots, bicycles, knitting machines, domestic quality power tools and gardening tools (except heavy duty spades and shovels, used for building). 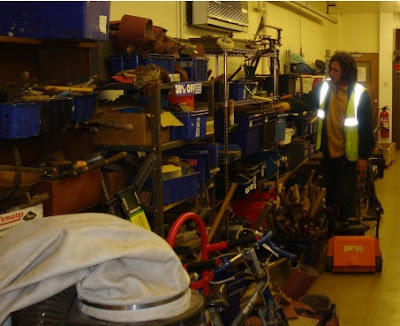 However, don’t let that put you off as they either pass on these unsuitable or surplus tools to other charities, use them in their own workshops, sell them or, in the last instance, send the metal to be melted down and recycled and use the wooden items to fuel stoves. When I mentioned the name of this blog, the other member of staff and the only other visitor burst into big smiles. It seems the Northampton branch of TFSR is a hotbed of permaculture. The chap in the day-glo jacket was perusing the shelves. He told me that he helped manage four acres of community permaculture orchard in Northampton and I assume, from what I’ve just said, that he is looking for good second-hand gardening tools.